Echinacea is perhaps most widely used as an herbal remedy to help fight off colds or the flu once ill. It’s often used in a tea or as a supplement to boost the body’s natural immune system, yet it has even more incredible health benefits even if you aren’t sick with a cold! Echinacea, also known as the Coneflower, is not only great tasting in teas, it is a pretty easy medicinal herb to grow in your own home and comes packed full of beneficial substances to help the body. It is a genus of herbaceous flowering plants in the daisy family known as Asteraceae. Echinacea is one of the most popular garden ornamentals with its showy purple flowers that attract all kinds of butterflies and bees. Echinacea is a beautiful medicinal plant to grow in the garden and hummingbirds love it. Because it is a perennial plant, it lasts for many years so you do not have to worry about replanting each year. It is approximately 1-2 feet (30-60 centimeters) tall when mature. It is slightly spikey and has large purple or pink flowers, depending on the species. The center of the flower has a seed head, a cone, which is also spiky and dark brown to red in color. Echinacea has a complex mix of active substances, some of which are said to be antimicrobial making it a great choice while combating a viral infection like a cold or the flu. The herb also contains alkylamides or alkamides, (although these are not in found in the species Echinacea pallida), which have an effect on the immune system, as well as polysaccharides, glycoproteins, and caffeic acid derivatives. 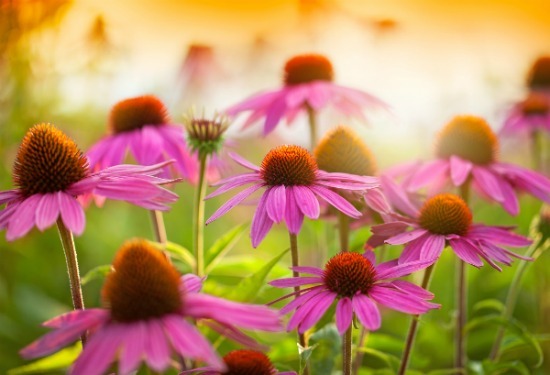 Many plants, including echinacea, contain phenols, which are active substances that help control the activity of a range of enzymes and cell receptors in the plant, and protect it from infections and ultraviolet (UV) radiation damage. Phenols also have antioxidant properties, which may be good for human health. Studies on whether or not echinacea has any effect on the cold have produced conflicting results. Scientists from the University of Connecticut School of Pharmacy reviewed over a dozen studies on the effects of echinacea on people’s risk of catching a cold. They concluded that echinacea could reduce a person’s chances of catching a cold by approximately 58 percent, as they detailed in the Lancet. They found that the herbal remedy also reduces the length of time a cold lasts by 1.4 days. However, other scientists reported in CMAJ (Canadian Medical Association Journal) (October 2005 issue) that the ginseng herb reduces the frequency of colds, but Echinacea does not. Because Echinacea is an anti-inflammatory herb, some declare it can be used to help treat or prevent acne. Echinacea extract is capable of phagocytosis, a process of devouring damaged cells, bacteria, and other microorganisms that cause infections. Whether it is taken internally or the herb is applied topically, echinacea just might boost the immune system and resist acne-causing bacteria. Since acne is often caused by infection and inflammation, echinacea may be able to help stop the eruption before it even begins to show. Echinacea’s anti-inflammatory properties can also reduce the appearance of red and painful acne too. Echinacea can also be used as a gentle laxative by helping to relax your gastrointestinal tract. The herb can help provide a mild relief from the discomfort of constipation. Drinking an herbal tea is especially effective to help with this fairly common condition. For more chronic conditions of constipation, a cup of tea every day can help loosen up the bowels, whereas 2–3 cups per day can help with sudden bouts. However, be sure not to overuse echinacea. Limit your tea intake to two cups a day maximum and take any supplements only as directed on their labels. Echinacea angustifolia is the recommended species to help with the specific ailments related to ADD (attention deficit disorder) and ADHD. The herb can be considered one of the natural remedies for ADHD. Both adults and children suffering from ADD/ADHD have a higher-than-normal chance of experiencing emotional disturbances, especially anxiety, depression, and social phobias. But just the right dosage of echinacea can alleviate some of the distress caused by these disorders. It’s recommended to only take 20 milligrams of the herb at a time and no more. In fact, taking more than 20 milligrams per dose can actually cancel out the echinacea benefits that help relieve anxiety. Echinacea products are commonly mislabeled; some have been tested and found to have no echinacea in them at all according to a National Institute of Health warning and reported by Medical News Today. Many of the benefits are also labeled as purely anecdotal, as studies have not been conducted in-depth on some claims. Echinacea generally doesn’t cause problems for most people, but some people taking the herb have reported some side effects such as an upset stomach or diarrhea. *This article is for informational purposes only. It is not meant to treat or diagnose any illness or health problem. Please seek help from a professional before using any supplement.